Today is the official launch of Stay Grounded, a new international network to counter aviation. Here is the press release. 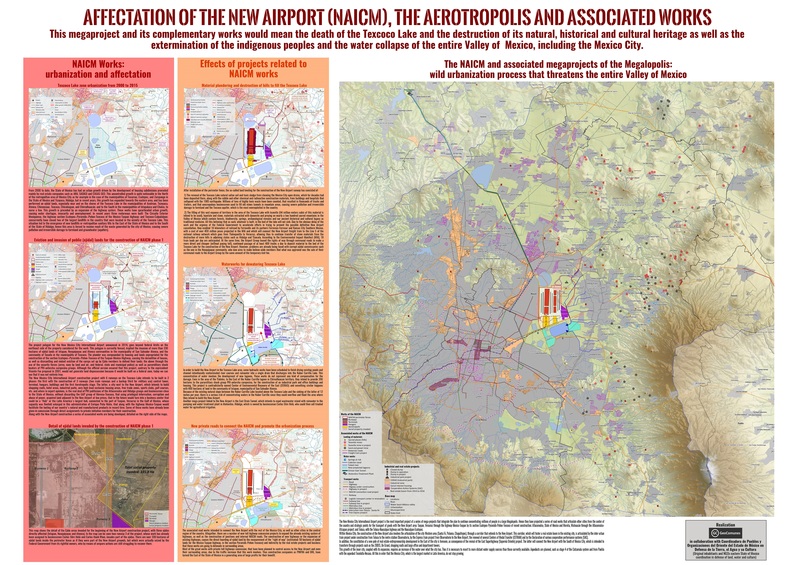 Aviation growth is causing increasing damage to the climate and communities, yet a massive wave of aviation expansion is underway and planned, at least 1,200 construction projects worldwide comprising new airports and expansion of existing airports. Stay Grounded is developing a global map of airport projects which are opposed by communities facing displacement from their homes and farmland, destruction of fishing grounds through land reclamation for offshore projects, deforestation, environmental damage from construction, health problems caused by pollutants emitted by aircraft and noise disturbance. 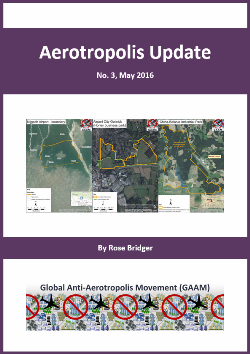 Over the following fortnight there will be a wave of protests raising awareness of aviation expansion and resistance. Stay Grounded has published a Position Paper, shown below, which has already garnered 110 signatories, from civil society organizations in 24 countries. GAAM is pleased to be among the signatories and a member of this new international network. 5,000 farmers from 20 villages are being displaced for a cargo airport in Ogun State, Nigeria. Residents of Igbin-Ojo and seven other communities have protested over land-grabbing. Crops have been bulldozed and they fear forcible eviction. A major cargo airport is planned in the Wasimi area (also referred to as Wasinmi) of Ewekoro Local Government Area of Ogun State, near Nigeria’s southeast coast. On 18th December 2017 hundreds of farmers from the village of Igbin Ojo and seven other communities in Ogun State protested against land-grabbing for the airport. Appealing to the Ogun State Governor Ibikunle Amosun to intervene community leader Ademola Tiwalade Adisa stated that, on three occasions, groups of people came onto their land. 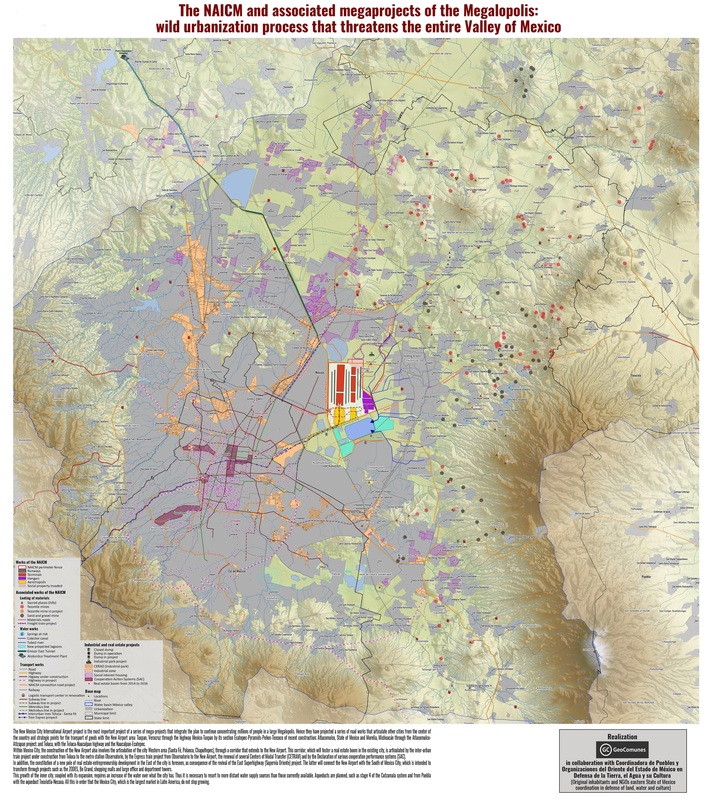 Adisa reported that, on 17th November a group of people with a bulldozer invaded their land, then, on 24th November and 8th December a larger group of people encroached onto their land and began mapping portions of it. Below are photos of the 18th December protest published by The Sun Newspaper. Narrating their ordeal of 8th December 2017 Adisa said that heavily armed men of the Rapid Response Squad (RRS) had forcefully arrested a number of people and, at gunpoint, forced him and his elder brother to sign an undertaking stating that they would not disturb work on their land. Villagers claim that the land trespassing and mapping was led by former chair of the Ewekoro Local Government Area, Mr. Dele Soluade, but he has repeatedly denied all the allegations, dismissing the claims he had illegally invaded the land as “unfounded” and insisting that he was acting under the instructions of Governor Amosun. A 4th February an article in The Guardian Sunday Magazine painted an alarming picture of the plight of residents of Igbin Ojo, ‘fighting the battle of their lives’ to resist displacement from their ancestral land. Over the course of a few weeks crops worth millions of Naira, including cassava and pineapple plantations, had been destroyed by bulldozers and caterpillars. Farmland measuring nearly 164 hectares serving as their providing main source of income had been leveled and forcibly taken away. Fear had enveloped other farmers, including people who had invested heavily in poultry facilities which they feared losing. Farmers were distraught, dispossessed of their land and anticipating being evicted from their homes, desperately worried about their own survival and the future for their children. One woman said that that the entire community was living in fear and hunger and that children were unable to attend school because parents were unable to afford the fees. One of the community elders, Pa Emmanuel Olukunle Opeagbe, said that the community had enjoyed ownership of the land from time immemorial up until 17th November 2017 when the first land invasion took place. He confirmed community leader Abisa’s account of land invasions by a group of people, which he described as “fierce-looking thugs”, and a bulldozer. He backed up community leader Adisa’s allegations of Soluade leading the land invasions and resorting to abuse, harassment, intimidation and threats to bulldoze people along with the crops. Opeagbe reported that Soluade had told villagers that their community would cease to exist. Along with Adisa, Opeagbe had been arrested and forced at gunpoint to sign an undertaking not to interfere with trespassing on the land. Residents appealed to the Federal Government, Amnesty International and human rights activists for support. On 16th February the Civil Liberties Organisation (CLO) responded, petitioning Governor Amosun over the unlawful acquisition of land and threat to their lives. State chair of CLO, Joseph Enitan, said intervention of the governor is urgently needed because Soluade is acting under his instructions to trespass and grab lands. Farmland was being invaded and destroyed, in the name of constructing a cargo airport. Community members including council chairman Kehinde Adepegba were shocked by recent developments. New areas of land had been claimed for the airport project and encroached upon, even though the land required for the airport was allocated to the project many years previously. A large portion of land had already been acquired for the proposed Ogun cargo airport, which was first conceived in 2005. Yet, shortly before the reports of land grabbing, in May 2017, the project languished abandoned; the only physical infrastructure that had materialized was a perimeter fence around an area of land measuring 5 x 5 kilometers. Farmers from about 35 communities, who had grown crops like rice and high-yield cassava had been displaced for the project, but they had not received compensation for the loss of their land and livelihoods. Opeagbe said the large portions of land that were “compulsorily taken for the project years back are yet to be compensated for” and that people had not protested against the airport because they believed it would bring development to their area and they would benefit from it. Farmland is being destroyed, and farmers displaced, for an airport project which aims to export farm produce; the Ogun airport project has been described as an ‘agro-cargo airport‘. It appears that the primary purpose of the airport is envisaged as ‘transportation of agricultural products to other parts of the world’, also referred to as export of perishable (temperature controlled) goods. Only cursory mention has been made of other potential functions for the airport such as import of consumer goods, machinery and industrial raw products, pilot training school, aircraft maintenance facility, helicopter and air taxi services. At the end of February Governor Amosun announced that 500 million Naira (nearly US$1.4 million) had been allocated for payment of compensation to farmers losing their land for the airport, saying that the money would be disbursed to 20 villages directly affected by the airport project. He also said that affected farmers would be relocated to an appropriate location where they could continue their farm business, making assurances that his administration would not bring hardship to the people. It was then reported that 1,000 farmers had been compensated for loss of their agricultural land and crops and the remaining 4,000 would receive compensation within the next few weeks. If it is indeed the case that US1.4 million has been earmarked for compensation of 5,000 farmers, then assuming the same amount is to be allocated per farmer this adds up to a mere US$280 each. Igbin Ojo is one of the villages listed as beneficiaries of the first phase of compensation, along with Pataleri, Igbagba, Mosan, Igbin Orola, Igbin Arowosegbe, Idele and Balagbe. Since this announcement GAAM has not found any reports of affected villagers’ response to the compensation offer, aside from a single resident of Igbagba village reportedly appreciative of prompt payment. There have been newspaper reports of officials making statements urging people to support the project, and exhorting its supposed benefits of employment for local people, economic development and attracting foreign investors. But it is evident that land acquisition for the airport is not supporting development, it is destroying communities. As officials proclaim potential positive impacts of the airport GAAM has not found any information on such vital matters as how the project will be funded and which firms and/or government bodies will be responsible for constructing, operating and managing the facility. But it is evident that a truly gargantuan megaproject is in the works. As he again implored residents to support the cargo airport Governor Amonsun said that ‘thousands of hectares‘ would be required for the project. Communities resisting loss of their land for Ogun cargo airport are dragging Soluade to court in an attempt to bring the land grabbing to a halt. Their struggle has parallels with farmers’ resistance to the Ekiti airport project, north of Ogun state. In October 2015 the state government of Ekiti sent in bulldozers to clear 4,000 hectares of farmland for an airport, without even discussing the project with affected farm owners in five villages. Farmers succeeded in stalling the land clearance and suspending the airport project. Opponents from within the state government supported the farmers, arguing that the project had begun illegally without adhering to due process and criticized the high level of state funding. 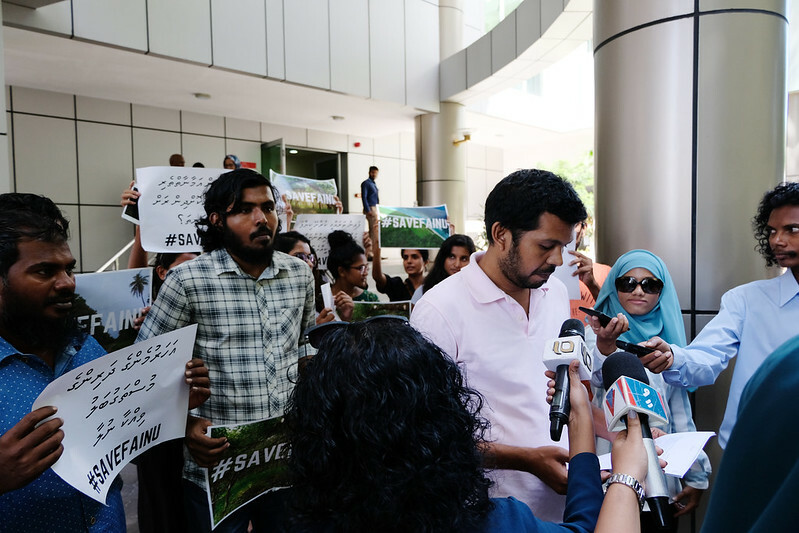 The farmers protested and filed a suit seeking damages for unlawful land acquisition, and in March 2016 were vindicated with a court victory upholding their claims. But in the interim ten Ekiti farmers died. Community members attributed their deaths to the terrible trauma of the injustice perpetrated by the state.